The Democrats continue to have an excellent chance to win control of the House, despite their lead falling on some generic polls, according to Stuart Rothenberg, but The Washington Post indicates a problem which could harm the Democrats in 2018 and 2020, as in 2016: Hillary Clinton reentering politics. Most likely, they said, Clinton will attempt to help Democratic candidates who have a history of supporting her and her family, and expending her political capital in a number of the 23 congressional districts she won in 2016 but are now held by a Republican. Lending a hand to Democrats organizing at a grass-roots level is a priority, they added. She will be supporting the politicians who have supported the Clintons in the past–in other words, conservative Democrats, and the types of Democrats who lost in 2010, 2014, and 2016. Since losing the 2016 election, Clinton has spent her time attacking the left, spreading pro-war hysteria, and undermining fundamental principles of Democracy, including freedom of speech and the acceptance of election results by the losing candidate. …the DCCC, its allied groups, or leaders within the Democratic Party are working hard against some of these new candidates for Congress, publicly backing their more established opponents, according to interviews with more than 50 candidates, party operatives, and members of Congress. Winning the support of Washington heavyweights, including the DCCC — implicit or explicit — is critical for endorsements back home and a boost to fundraising. In general, it can give a candidate a tremendous advantage over opponents in a Democratic primary. In district after district, the national party is throwing its weight behind candidates who are out of step with the national mood. The DCCC — known as “the D-trip” in Washington — has officially named 18 candidates as part of its “Red to Blue” program. (A D-trip spokesperson cautioned that a red-to-blue designation is not an official endorsement, but functions that way in practice. Program designees get exclusive financial and strategy resources from the party.) In many of those districts, there is at least one progressive challenger the party is working to elbow aside, some more viable than others. Outside of those 18, the party is coalescing in less formal ways around a chosen candidate — such as in the case of Pennsylvania’s Hartman — even if the DCCC itself is not publicly endorsing. 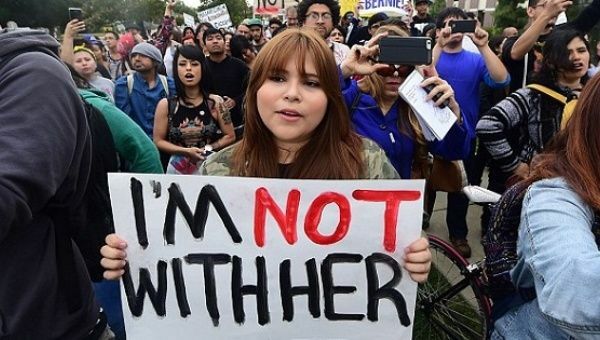 It is also discouraging that many of the same people who handed Hillary Clinton the nomination in 2016, which led to the election of Donald Trump, continue to lead the DNC, with progressive members having been purged last fall. So far the DNC has not adopted the recommendations of the Unity Commission, which were rather tame and did not go far enough to reform the Democratic Party. The future of the Democratic Party must be on standing for principles, not seeing more of Hillary Clinton, who embodies what is most rotten in our politics. Posted in Democrats, Donald Trump, Hillary Clinton, Politics, Polls. Tags: Democrats, Donald Trump, Hillary Clinton, Politics. RSS feed for comments on this post.. TrackBack URL.